The doorbell rang as Luisa refilled the empanada trays. Her hands were still powdered with the residue of flour, kissed with tiny sugar flakes. She looked over the counter and saw two beautiful blonde boys eyeing the sweets. Their faces young, unblemished, how she imagined her own child now looked. The bell rang again, and an older man and woman walked in and towards the boys. Family, Luisa thought. She wiped her hands on her apron and took two plastic gloves out of its dispenser from the countertop. Hi there, what are these called? The pink ones? The man pointed down towards the glass. 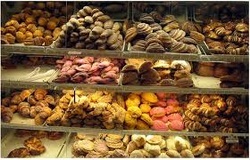 Those pan dulce, she said, that whole side pan dulce. The man looked away from Luisa, bent down and cupped his knees. Paan doolsee, he said to the boys. One of the boys walked over to where the register sat and stared at the various candles and images of the Virgin that stood just behind it. It’s like church, he said and looked over to his mother. Luisa glanced over to the other boy, the younger one, who was now giggling as he poked at a marionette hanging from over the small refrigerator, the one she thought would make a decent birthday present for her son. This was but one moment of many when Luisa longed for home again, for Jalisco, Mexico. She was told that living across the border was her best shot at making and saving money, but that it was easier to get her into the country alone. It was only three days later when Luisa awoke before her child would cry from the touch of the summer sun, and wept in thought of life without him. As the heat soaked through the sheet that hung around the crib, the sleeping two year old cried. She wouldn’t hear it again. She opened her hand out and gently placed her thumb on his forehead, bringing it down towards the end of his nose so softly she barely touched him. Their exchange was simple, but theirs, and she liked to imagine that he knew it. This is why you cry, she thought, to know I’m here. Letters were exchanged, photos, and the money she sent back to her mother kept them clothed and healthy. She watched him grow through the photos, a sort of flip book that recorded his growth from an infant to young boy. Your eyes, but his own spirit, her mother once wrote. Do you have enough to get him? A co-worker once asked. The boys finally landed on one pastry each. Apple Empanadas. They were picked out of their own litters, bagged, and handed over to the man. He counted the coins in his palm before letting them slip out into the clay tip jar that sat next to the register. You’re welcome, Luisa said with a smile. The younger boy kept his eye on the marionette. Can I have the toy? he asked his mother. No. The mother reached into the bag, pulling out the empanada with her index finger and thumb in an attempt to show the boy that he already got something. But he was determined, and so cried. Luis began to feel the pierce of heartache as she began to compare the boy’s cries to all those she had missed from her own. What did he even sound like now? The man and woman began to open the entry door in an attempt to scare the boy of their leaving. His brother followed. Por favor, Luisa said as she walked from around the counter. She wiped her hands on her apron once more, and reached over the boy to the marionette. The strings began to swing, clacking the pieces of wood together in an array of tones and notes that radiated throughout the silent bakery. Luisa bent down on her haunches, weaving her hand side to side, making the marionette dance towards the boy. Hijo, she said, he’s now yours to dance with. The marionette bobbed up and down, kicking its legs up one by one, and she imagined herself talking to her own, if only a moment, in what she referred to as her life without air.